Originally built in 1814, the Town Hall is situated at the top of Haslemere High Street. This iconic building complete with bell tower, houses the historical Council Chamber decorated with an ornate ceiling and a bespoke-crafted stained-glass window depicting the Haslemere Coat of Arms, whose motto: ‘Vita musis gratior’ was the inspiration for the UK's first-ever Haslemere Coat of Arms Rug Weaving created by Anas and Sandre and gifted to the Town in 2010. (See: The Haslemere Coat of Arms Rug Weaving and read about the Rug Weaving's creational journey of 800,00 rug knots). In August 2012, Mayor Cllr. Cyndy Lancaster accepted the ‘custodianship and trusteeship in perpetuity’ for the Diamond Jubilee Embroidery on behalf of the Town and its Council, from the High Sheriff of Surrey Mrs Karen Schemer at an Honorary Presentation Ceremony held at the Town Hall. The embroidery was especially created by Anas and Sandre as a Gift for HM the Queen, to commemorate Her 60 years of sovereign reign. This gold-framed embroidery now resides in pride of place above the Mayor’s Chair in the Council Chamber. 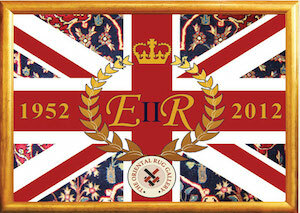 (See: HM the Queen's Diamond Jubilee Embroidery and read about the creational crafting of this bespoke Queen's Gift). Among its other treasured artifacts, the oak-panelled Council Chamber houses a framed painting of HMS Haslemere and a copy of the original Elizabeth I Charter, granted in 1596. The public are welcome to view this historical Town Hall, whose Council Chambers are available for private hire including exhibitions, private art views, business lunches, meetings and anniversary celebrations. Celebrating its 125th Anniversary in 2013, Haslemere Educational Museum is one of the largest Natural History Museums in central southern England, with over 240,000 specimens and more than 140,000 Human History artefacts from around the World. This comprehensive Museum also houses three large permanent galleries of Geology, Natural History and Human History artefacts, as well as a library, an education room, and a galleried, arch-beamed lecture hall, while its expansive grounds contain a large pond, an observation beehive and a tree trail. Haslemere Educational Museum are also the proud ‘Custodians In Perpetuity’ for the UK’s first-ever hand-woven and rug-knotted Haslemere Coat of Arms Rug Weaving, created by Anas and Sandre at The Oriental Rug Gallery Ltd. 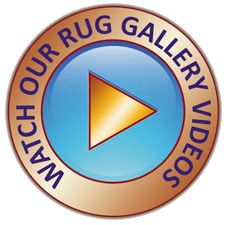 Here you can read about the Rug Weaving's two-year creational journey on our dedicated web page. Meanwhile, see the the Museum Team's Special Christmas Visit to The Oriental Rug Gallery Ltd, to support and participate in our Coat of Arms Rug Weaving's creation. Catch up with the HRH Countess of Wessex's Museum visit, her viewing of The Haslemere Coat of Arms Rug Weaving, and Sandre and Anas' honoured presentation at: HRH The Countess of Wessex meets The Oriental Rug Gallery Ltd.
You can also read all about our ongoing endeavours in supporting the Museum’s specialist aims and ventures at: The Oriental Rug Gallery Ltd's: Corporate Patronage of Haslemere Educational Museum and The Oriental Rug Gallery Ltd's: Adopt An Object Sponsorship at Haslemere Educational Museum. The Museum is independent and relies entirely on the financial support of its visitors and members, so please support this worthwhile cause and safeguard the Museum’s treasured heritage for everyone to continue to enjoy! The Weavers' Company is the oldest recorded Livery Company in the City of London, first recorded in the 12th Century.Its earliest Charter (still in the Company's possession) was granted by King Henry II in 1155. By this Charter, the Company gained the monopoly of its craft and the rights of supervision, thereby ensuring a high standard of weaving craftsmanship, while securing the ‘art and mystery’ of its Guild craft. Today, The Worshipful Company of Weavers fulfils a significant role in the modern textile industry, with major contributions to textile weaving through its many awards, scholarships and bursaries, while many of its members are involved in the textile industry. The Worshipful Company of Weavers are proud to have Sponsored the mounting and framing of The Haslemere Coat of Arms Rug Weaving. The Heraldry Society exists to increase and extend interest in and knowledge of heraldry, armory, chivalry, genealogy and allied crafts. The Society is non-profit making and is registered as an educational charity. Subscriptions help to further the aims of the Society, where members can receive the Society’s quarterly newsletter: The Heraldry Gazette. Society Lectures are held in London providing a forum for scholarly research, as well as offering a broad range of talks on heraldic and related subjects. The Heraldry Society are proud to support The Haslemere Coat of Arms Rug Weaving. The College of Arms is the official archive of the coats of arms and pedigrees of English, Welsh, Northern Irish and Commonwealth families and their descendants. The officers of the College, known as heralds, specialise in genealogical and heraldic work. Coats of arms have been and still are granted by Letters Patent from the senior heralds, the Kings of Arms. A right to arms can only be established by the registration in the official records of this prestigious College. Although a branch of the Royal household, it is self-supporting. The maintenance of the College building, and the preservation of its records are derived from the fees payable upon grants of arms, and not from public funds. 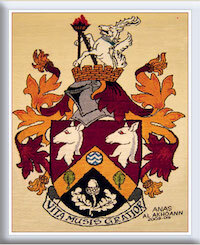 The College of Arms are proud to have Sponsored the mounting and framing of The Haslemere Coat of Arms Rug Weaving. Founded in 1894, the Society’s honoured patron is Her Majesty The Queen. The Royal Society of St George's objective is to promote ‘the English way of life’, with branches throughout England, The Commonwealth and many other English-speaking nations. In May 2000, Mr Michael Mills, as Founder Chairman of the Haslemere Branch, officially accepted the Foundation Certificate from Dr Ivor Wilson, Regional Councillor of The Royal Society of St George, at a ceremony held in Haslemere Town Hall. The Haslemere Branch Chairman is Mr Nick Hinchliffe MstJ. St George is the Patron Saint of England and St George's Day is actively celebrated by thousands on 23rd April each year, where The Oriental Rug Gallery Ltd's participation can be viewed through the years in our 'G-Blog webpage listings. 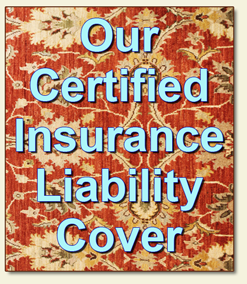 You can also read all about the crowing of The Oriental Rug Gallery Ltd as: Winners! of The Royal Society of St George Cup. Described by former Poet Laureate Sir John Betjeman as “the most beautiful building of its age in Haslemere” and reputed to have been one of his favourite churches, St. Christopher's Church in Wey Hill is an exemplary model of the Arts and Crafts Movement. This historic church has many unique, original and interesting features including its barrel-vaulted ceiling, a painted triptych for the High Altar, stained-glass windows, a decorated Hanging Rood Cross and Peasant Art furnishings all preserved in excellent condition, including an elusive Church Mouse mural. The rare, antique hand-woven Persian Carpet, housed at the Church and displayed on the Chancel’s parquet floor, was recently identified, revived and conserved by The Oriental Rug Gallery Ltd. See: 'Rescuing St Christopher's Church Rare Peacock Carpet'. Charles Spooner, an architect, craftsman, teacher and friend of William Morris, whose main interest was in wood carving, designed most of the interior oak wood furnishings and attracted some of the best of the Arts & Crafts world to work at the church, all of which remains largely unchanged since the Church's consecration in September 1903. This building is a 'must see' listing for those interested in the Arts and Crafts Movement and the Peasant Arts Movement, and, with its wonderful accoustics, an exceptional place for attending seasonal concerts and events. Please contact: St Christopher's Church for more information. Haslemere has a notable Arts and Crafts history where, through the years, many distinguished artists, weavers, poets, authors and music makers such as: Tennyson, George Bernard Shaw, the Dolmetsches, Sir Arthur Conan Doyle, and George Eliot, as well as artists Helen Allingham, Axel Haig and Walter Tyndale and architect Edward Lutyens have chosen to live and practice their artisan crafts. The Peasant Arts Movement was also founded in Haslemere by artists: the Blounts, the Kings and G MacDonald, who taught the ancient crafts of yarn spinning and hand-loom rug weaving, while creating hand-spun tapestries and embroideries that are now held in the V&A and Haslemere Educational Museum. Garnering this heritage, Haslemere Festival was created as a bi-annual event – now in its sixth, successful year – showcasing a two-week tableaux of art, music, talks and entertainment with the Cycling Sportive, Classic Car Show and the (new) triathlon held every year. Festival Patrons include:Dame Sarah Goad DCVO, Lord Lieutenant of Surrey, Rt Hon Jeremy Hunt MP, Dr François Dolmetsch and Admiral Sir Derek Reffell, KCB. The Oriental Rug Gallery Ltd is proud to support this cultural event through the years, where Anas and Sandre are, once again, Festival Stewards for 2015. The Oriental Rug Gallery Ltd was previously invited to take part in the Haslemere Festival 2009, by Founder and Chairman Hamish Donaldson DL MBE, where the Rug Gallery's featured Cultural Talk: A Journey of Discovery for Oriental Rug Weavings & Tapestries was a sell-out event. The Haslemere & District Chamber of Trade and Commerce aims to support businesses and retailers in Haslemere and surrounding districts, by focusing on local news and issues, where its members can partake in planned activities via its website. Working alongside Haslemere Town Council, Haslemere Initiative, Haslemere Vision, Waverley Borough Council and Waverley Business Forum, Haslemere Chamber seeks to promote dialogue and interaction with local businesses and retailers. Other activities include the co-ordination of the annual Christmas Lights and popular Christmas Carols events. Along with Haslemere Town Council and Haslemere Educational Museum, the Haslemere & District Chamber of Trade and Commerce was part of the creative heritage collaboration in proudly supporting The Haslemere Coat of Arms Weaving, bequeathed by Anas and Sandre, as their gift for Haslemere Town. 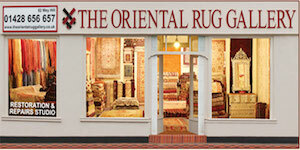 You can also read about The Oriental Rug Gallery Ltd as Winners! of The Haslemere Chamber Award and their Sponsoring and Presention of the Chamber Award the following year. 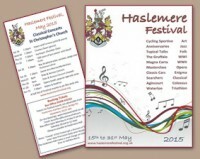 Sandre's passion for Haslemere led to her being invited by Madam Mayor Cllr. Melanie Odell to step forward for nomination to join the Haslemere & District Chamber of Trade & Commerce Committee – a proud honour. Having been unanimously elected by the Committee, she served with Chamber Presidents: Simon Labrow and Melissa King. With a Royal Warrant granted by Her Majesty The Queen as ‘Manufacturer of Horticultural Labels’, this specialist Haslemere-based company supplies bespoke, hand-engraved labels for either botanical, horticultural or arbicultural uses, or where elegant and discreet information needs to be displayed. They also supply ‘Sheen’ plant label systems and ‘Kew-developed’ tree fixings for their clients including: Royal palaces, stately homes, botanical collections, public and private gardens and arboreta, landscape gardeners, universities, colleges, zoos, an open-air theatre in Cornwall, as well as art and sculpture exhibitions. See: The Specially-Commissioned Plaque for The Haslemere Coat of Arms Rug Weaving, and read where Sheen Botanical Labels Ltd are proud to have Sponsored the mounting and framing of The Haslemere Coat of Arms Rug Weaving. Makers of English stoneware since 1956, this long-standing Pottery company is based in Grayshott Surrey. Originally producing ceramic giftware for London stores and gift shops, it now creates studio art ceramics for galleries and homes, while its Stoneware Master Potters, hand-craft catering ware for many well-known national high street restaurants, bespoke ceramics for top celebrity chefs, as well as blue plaques for famous, historical people, commemorative mugs and lamp bases. Mr Phil Bates, Trustee of Grayshott Pottery is proud to have Sponsored the mounting and framing of The Haslemere Coat of Arms Rug Weaving. 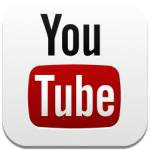 Friendly Disclaimer: although we recommend the above websites, we neither claim nor accept any responsibility for their content or information contained therein, which you may visit following a link from this website.